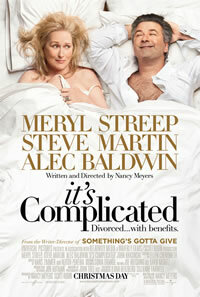 I had the opportunity to see the new movie It’s Complicated last night at a pre-release screening in Times Square. It didn’t knock my socks off, but it was pleasant and funny, and I enjoyed it. It was the first time I’d seen Steve Martin in a non-comedic role. He was totally believable. It’s the story of a divorced woman, played by Meryl Streep, who ends up in an affair with her ex-husband, played by Alec Baldwin. And then there is the divorced architect, played by Steve Martin, who also is interested in Streep’s character. I won’t tell you who wins. I thought the acting and direction were better than the script, which was a bit predictable. The acting was great; everyone in it was good. One very funny scene was when Streep’s character tells her children about the affair with their father, thanks to some inspired direction (or maybe it was in the script, who knows). I won’t spoil that for you, either. The movie has many funny moments – one in particular is fall-on-the-floor funny. If you see it, you’ll know which one I mean. The film consistently held my attention, never dragged. But it became obvious fairly early on what was going to happen, so there wasn’t a lot of suspense. Nor was there much depth in the character development. This is okay in a light comedy, there just wasn’t a lot to it. It’s a simple story with simple characters. I’d rate it good but not great, pleasant but not profound. It’s a pleasant way to spend a couple hours, but not the kind of movie you tell all your friends they have to see.